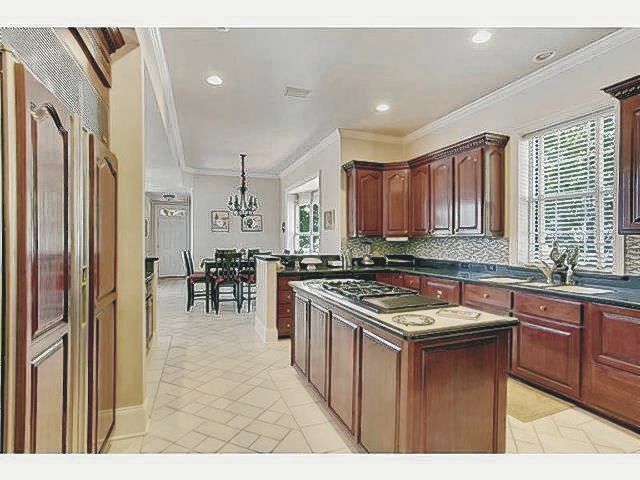 This is an extremely attractive listing in the bustling city of Kenner with its Rivertown theatre. 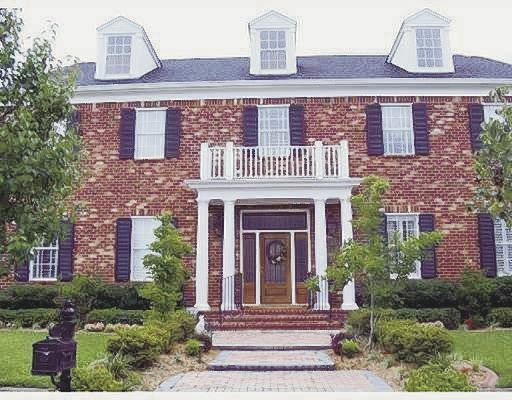 It’s a brick house with a four-columned façade with bricks leading up to its front door. It has a nice portico with a gallery on top and three dormer windows. A magnificent staircase leads from the marble-floored foyer up to the second floor, where there are five bedrooms, three full- and three half-baths. The kitchen is uncommonly lovely with a tile floor, cherry cabinets, plenty of storage and lots of light. There’s also an eating area with its own chandelier conveniently adjacent to the kitchen. The living room is huge and magnificent with its own bar big enough for five barstools and polished wooden floors. It also has a balcony with wooden railings overlooking it. The bedrooms are quite large and have wall-mounted televisions. The master bath is a joy with glass brick windows to let in light, but protect privacy, a separate shower and Jacuzzi tub and loads and loads of counter space. The house also has a study with built-in bookshelves. Kenner, taken from the historically French Cannes-Brûlées, is the seventh-largest city in Louisiana and the largest city in Jefferson Parish. Originally inhabited by the Tchoupitoulas Indians, the area along the Mississippi River was the first land in the New Orleans Metropolitan Area on which Europeans set foot. René-Robert Cavelier, Sieur de La Salle landed there in 1682. In 1855, Kenner was founded by Minor Kenner on land that consisted of three plantation properties that had been purchased by the Kenner family. At the time, all land north of what is now Airline Highway was swampland. Kenner’s growth began in the late 1950s when developers began subdividing, draining and filling the swampland in the northern half of the city. During the 1960s, the construction of Interstate 10 and improvements to Veterans Memorial Highway aided the rapid development of Kenner as a suburb of New Orleans. In 1982, Pan Am Flight 759 crashed in a residential area of Kenner when a microburst forced it down. Eight people on the ground were killed, as were all 145 people aboard the aircraft. Six houses were completely destroyed and five more substantially damaged. In Kenner on May 10, 1870, “Gypsy” Jem Mace defeated Tom Allen for the heavyweight championship of the bare-knuckle boxing era; a monument marks the spot near the river end of Williams Boulevard. During 1915–1931, a New Orleans streetcar line operated between New Orleans and Kenner. The line ran between the intersection of Rampart and Canal in New Orleans and the intersection of Williams Boulevard and Jefferson Highway in Kenner. On September 5, 2018, Mayor E. Ben Zahn III circulated a memo banning the use of Nike products or the Nike logo for use or delivery to any City of Kenner Recreating facility as a reaction to the decision by Nike to feature Colin Kaepernick in its advertising after his decision to kneel during the playing of the US national anthem at NFL games to protest inequality and police brutality. On September 12, Mayor Zahn reversed the ban after political and legal criticism, stating that it placed Kenner in a false and unflattering light on the national stage.